Within the next month, I will have celebrated the birthday parties of all 3 of my kiddos. A lot of work, but at least I'm all done for the year afterwards, right?? I really do enjoy crafting for their parties - it's an excuse to decorate the house and try out new ideas that I find on other crafty blogs... Like this tutorial, making gorgeous hanging balls out of crepe paper and styrofoam balls. 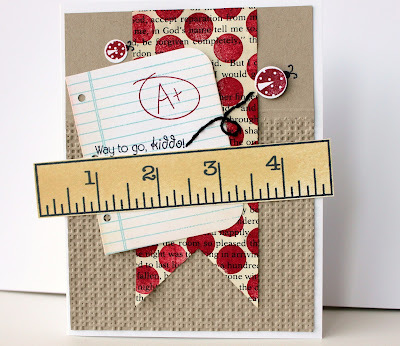 PTI blog hop: embroidery floss! 2 days ago, I was trying out different ideas, hoping one of them would translate into a ballerina invite or favor for Sofia's upcoming party. No luck there (she informed me the color scheme wasn't to her liking - pink and hot pink are apparently the way to go), but then I remembered that it was almost blog hop time! And lucky me, the piece used embroidery floss :) The challenge this month is to be creative with floss - I don't know how creative this is (it's straight-up stitching), but at least I can join in the fun. I actually love this card. Maybe because I'm getting into the girly-ballerina-thing that Sofia's so excited about, but adding tutus to anything is fun times. And I know it's an old trick, but it was the first time I used my copics to color the clear rhinestones - how about that? Instant project match! Love it. Are you on complete cuteness overload from these carrots?? MIM time again - this time, to color an image stamped on a non-neutral paper. I don't know why I chose to work with such a deep color - *smacks self on forehead* - but whatever. I think it ended up looking so pretty. I love the depth it gives the flower to color it with the copics. I used PTI's "YOTF: marigolds" and "Framed" - and I'm mostly mentioning which sets I used because I MUST know how you manage to stamp the frame (from "framed") any kind of straight. I always have to stamp on a separate paper and cut it out. Which, to me, defeats the purpose - no? Have a great day and thanks for looking! Searching through my stash, I found these little die-cuts that I had stamped with some images from "everyday button bits" - borrowed from a crafty friend! They add such a sweetness to these sewn tags! I had some scrap fabric that I sewed into a ruffle and then secured to a soft band... perfect frame for her chubby little face, don't you think? birthday tags & sewing machines. I've never even tried the zig-zag stitch on my machine before! I feel like I just ran a marathon. I need to eat some chocolate to calm my nerves. I look forward to becoming better acquainted with my sewing machine... tomorrow. Everything was paper-pieced, even the tiny red hearts in the sentiments. I put my paper-snips to work, lol! 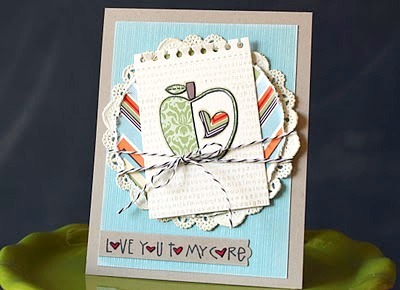 I love my SU papers, and they were a perfect fit for my cute green apple... thanks for looking! 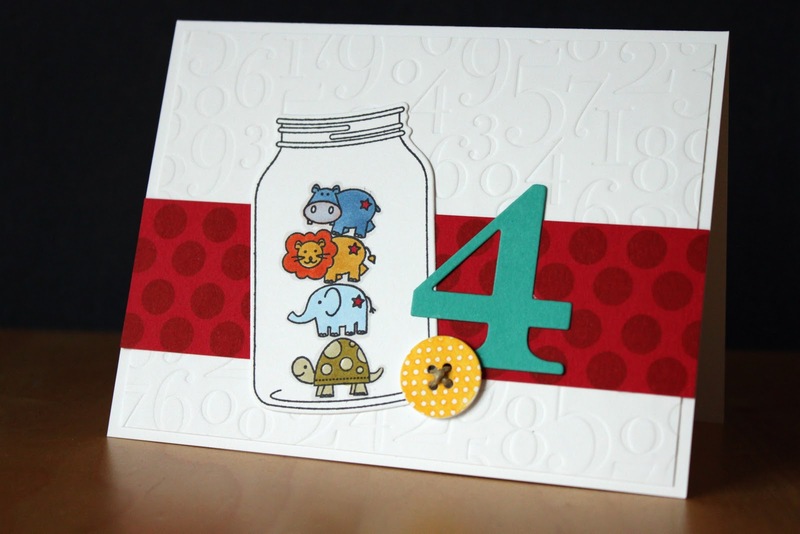 A new MIM challenge over at PTI! This time, to use an impression plate on only part of your panel. I love this look! I used my SU square lattice folder about 3/4 up the kraft cardstock and added some score-lines above to create some definition. And totally unrelated, but did any other mommies have a harder time getting the little ones to school this morning? Sofia was dragging her feet because of the time-change, poor thing. Then again, so was the hubby :) Same difference, I guess. I was just playing around with the "friendship jar" set and seeing what I could put inside. Thomas, taking a break from his game of Wii bowling, suggested I throw in some pirates. I thought the sight of pirate heads floating around in a jar would be kind of morbid, so I re-directed him to some of the animals from "tiny treats: birthday." I have 3 kids with birthdays within 10 days of each other (yes, I know what that implies...) Up until now, I've stuck the older two together with unisex-themed parties: the princess and the frog, circus, and little chefs. They all worked out great. But, (and nothing good ever comes from the word "but") this year they each want their own parties, with their own friends. Sofia wants a ballerina party. Thomas wants a pirate party. Maia, who will be turning 1, will be getting her party-on woodland-style. And, since I'm already exhausted trying to keep track of the kids' numerous suggestions for their parties ("you hafta have a REAAAAL plank at a pirate party! "), I decided to start off by making some decorations for sweet little Maia's party. Because she has no expectations, doesn't rattle off demands, let me choose the party theme, and stares at me (in what can only be described as) in awe when I show her what I've made... lol. I resisted for so long... but those tulips sent me over the edge - I had to have this set! And by the way, I WAITED for it - I don't know what Canadian customs was doing with my package for, like 3 weeks, but whatever. Here's a close-up so you could see how I popped up the paper-pieced tulips (but not the leaves). I thought it gave a bit of dimension to an otherwise simple card. I stamped the medallion from mat stack 2 in a pattern on the base cardstock layer, then distressed a layer of gorgeous basic grey paper, added a sentiment from signature greetings and a leaf from turning a new leaf. I distressed the leaves with the edge of my scissors - I like how that looks! I also wanted to add a pattern to the leaf image, so I inked it up in yellow and "kissed" it to the striped image from background basics: retro. Once in red and again in blue. Hope you like it! Did ya miss me? Probably not, lol. We packed up our crazy family and went to Vermont for a few days of spring break. Apparently, 3 other families we know had the same idea :) Our kids had the time of their lives with other little friends in the hotel pool (and when you are 5 and 3 yrs old, there is nothing more fun as swimming in the hotel pool - it's a fact. Let's not talk about the 10 month old who freaks out over everything... water included.) We even ran into Sofia's school principal - in her sweats, feeling around for her morning coffee at the breakfast bar... hilarious. See? No extra layers. And by the way, thanks for reading my blog. You're a peach. xoxo.